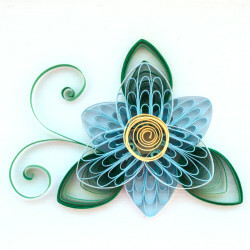 Quilling is an art form that involves the use of thin strips of paper that are rolled, shaped, and glued together to create decorative designs or in my case, mostly flowers. My first quilling kit was a Christmas present and I’ve enjoyed it so much that I’ve added many other tools to my toolkit such as the comb and glue bottle . Although they look difficult to make, they are actually quite easy and are a great outlet for creativity. I’ve also found it is a great “quick craft”. Many flowers can be created in just an evening, some in minutes!